Have you ever had a secret so long that it was almost killing you to let the cat out of the bag? Well in this case the treat out of the bag! I am happy to introduce to you SPIKE by Petcurean, a grain-free dog treat with no by-products, no added growth hormones, glycerin, artificial preservatives, flavors or colors. The new Spike line of treats has two varieties, one which I will introduce to you this month, the Jerky treats and next month the Bars! I always found it hard to find a Jerky treat. With all the poorly processed products in the past I have stayed very far away, often making my own treats, but when you make homemade treats that can take up a lot of time. 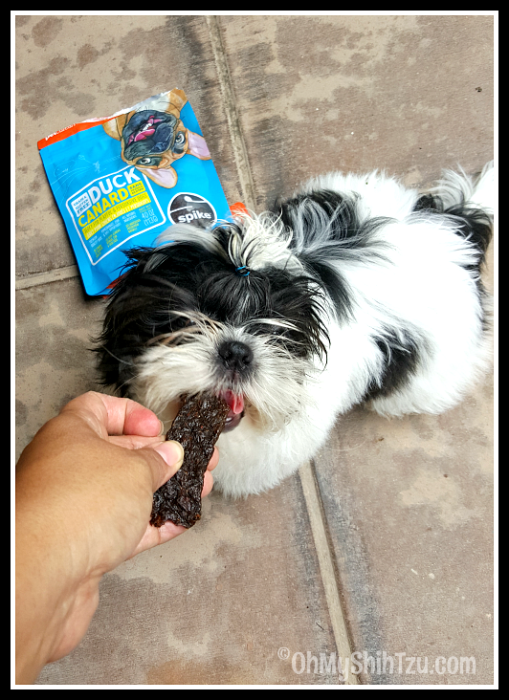 So I was so excited this past summer when I learned that the folks from Petcurean would be introducing their own line of jerky treats. Since I have a lot of training sessions with our dogs I love the ability to switch up the flavors of the treats to keep motivation and interest high. 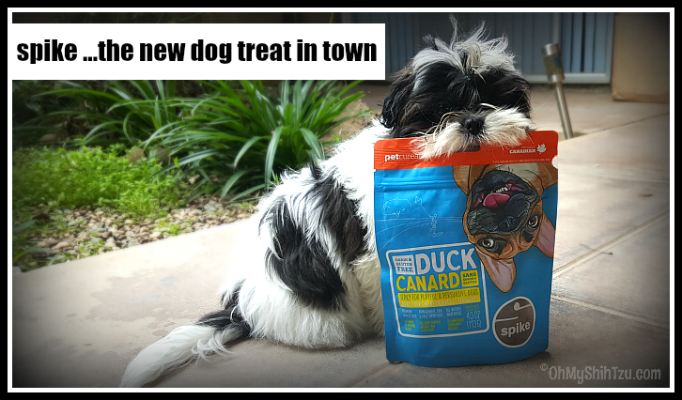 Petcurean Spike jerky treats come in 4 novel proteins, venison, duck, catfish and turkey! They also are high in micronutrients, anti-oxidants and superfoods such as chia, kale and pomegranate. All of which really keep my girls (and now little man) going on the field. Disclaimer: Petcurean has compensated us for being blog advocates of their products, and is providing food for Riley and the girls. Petcurean also has generously donated $500 worth Petcurean Dog Food to Lone Star Shih Tzu & Lhasa Apso Rescue in Texas in the name of OhMyShihTzu.com . Lone Star is a wonderful Shih Tzu rescue that is close to my heart for everything that they do for the Tzus! Please know that we only share what we believe is good for your pet, and a brand you can trust. We believe in honest and truthful reviews to protect you and your family. The views of this blog are of my own and monetization has no bearing on my positive or negative reviews of a product. It’s good to know there’s a quality jerky treat out there! You have to be so careful with jerky treats, where they’re source from as well as where they’re made.